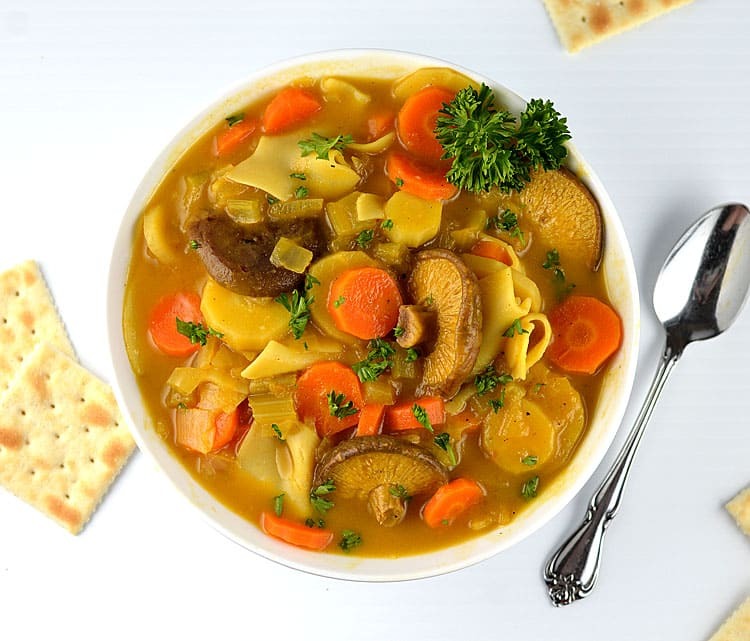 Cold & flu season is in full-force, and while this Immunity Boosting Vegetable Soup won’t actually cure the common cold, this soup is packed full of nutritious ingredients – each with it’s own set of well-documented health benefits. With much of the country still under very cold and snowy conditions, it can help take away the chill that winter brings. When I was developing this recipe and researching immunity boosting foods, I found it really interesting to learn the history and science behind some of the ingredients. 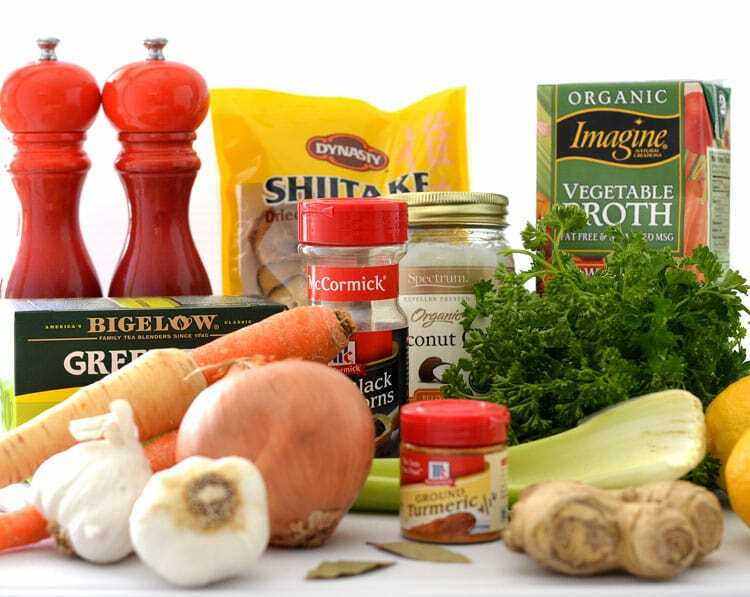 Here are just some of the health benefits associated with the ingredients in our soup! LEMONS: This citrus fruit is high in vitamin C and reduces inflammation, swelling and mucus production. Lemons have antioxidant properties which are vital to a strong immune system. GREEN TEA: In fact, studies have also proven that combining lemons with green tea significantly boosts the bioavailability of its antioxidants. These polyphenols are what’s believed to give green tea its immune-boosting effects. One study even suggested that a particular type of polyphenols called catechins may actually kill influenza viruses. SHITAKE MUSHROOMS: The Chinese have used the shitake mushroom for medicinal purposes for over 6,000 years. Shitake increase the production of cytokines, which are cells that help fight off infection. They also contain polysaccharides, which support the immune system. The most potent cold and flu fighting mushrooms are shitake, maitake and reishi. BLACK PEPPERCORNS: Black peppercorns are high in piperine, a compound known for its anti-fever and pain-relieving qualities. GINGER ROOT: Besides soothing a scratchy throat, ginger has chemicals called sesquiterpenes that target rhinoviruses – which are the most common family of cold viruses – as well as substances that help suppress coughing. Ginger is also a natural pain and fever reducer … and a mild sedative. According to ayurveda, ginger warms the body and helps to break down the accumulation of toxins in the organs, particularly in the lungs and sinuses. By opening up the lymphatic channels and keeping things clean, ginger prevents the accumulation of the toxins that make you susceptible to infections, especially in the respiratory system. BAY LAUREL LEAVES: The components in the essential oil of bay leaves have been used in many traditional medicines in the treatment of arthritis, muscle pain, bronchitis and flu symptoms. COCONUT OIL: Coconut Oil strengthens the immune system because it contains antimicrobial lipids, lauric acid, capric acid and caprylic acid – all of which have antifungal, antibacterial and antiviral properties. Our bodies convert lauric acid into monolaurin which research has supported as an effective way to deal with viruses and bacteria that cause diseases like the flu. ONIONS: Onions have both anti-inflammatory and immune effects. The trace mineral selenium, which helps reduce inflammation and stimulates immune function, is found in higher concentrations in onions than in other vegetables. It is said that selenium may play a part in the management of viral, inflammatory and allergic conditions. Onions in particular help to decrease phlegm and inflammation in the nose and throat. GARLIC: For thousands of years, cultures all over the world have used garlic to help treat symptoms of the common cold. Used as both food and medicine, garlic gets its immune-boosting powers from a compound called allicin which is activated when garlic is chopped, chewed, crushed or cut. Because it contains vitamins A and C, garlic is considered an excellent treatment for colds and other respiratory illnesses. It acts as a natural decongestant and expectorant and some studies have shown that if garlic is taken at the onset of a cold it can soothe symptoms and shorten the duration by as much as 50 percent. According to drweil.com, eating garlic may reduce the frequency and number of colds when taken for prevention. CELERY: Celery is rich in vitamin C, which boosts the strength of the immune system. Because of the high content of vitamin C, eating it regularly can reduce your risk of catching the common cold, as well as helping to protect against a variety of other diseases. CARROTS: Carrots are an excellent source of beta carotene, which gives them that bright orange color. One of beta carotene’s jobs is to support the body’s mucus membrane, which lines the respiratory and intestinal tracts, making it harder for bacteria to enter the bloodstream. PARSNIPS: Although they resemble carrots, parsnips are paler with a stronger flavor. They host an array of benefits. Parsnips are rich in Vitamin C, which is essential in helping to build a strong immune system helping to ward off potential infections such as the common cold. They are a very good source of folic acid, vitamin B6 and Vitamin E. Parsnips are also a good source of potassium. TURMERIC: Turmeric is considered to be a general immune system booster due to its high antioxidant capacity. Recent research also suggests that it possesses strong anti-inflammatory properties that could help reduce symptoms associated with colds and flu. Turmeric also contains unique immune-stimulating polysaccharides, which can potentially aid the healing process in the body. PARSLEY: Parsley has been cultivated for more than 2,000 years and prior to being used as food (or that garnish for your plate) it was originally used as a medicinal plant. In fact, ancient Greeks held parlsey to be sacred. According to historians, it is believed that parsley began being utilized as an herb in Europe in the middle ages. The high vitamin C, beta carotene, B12, chlorophyll and essential fatty acid content make parsley an extraordinary immunity enhancing food. 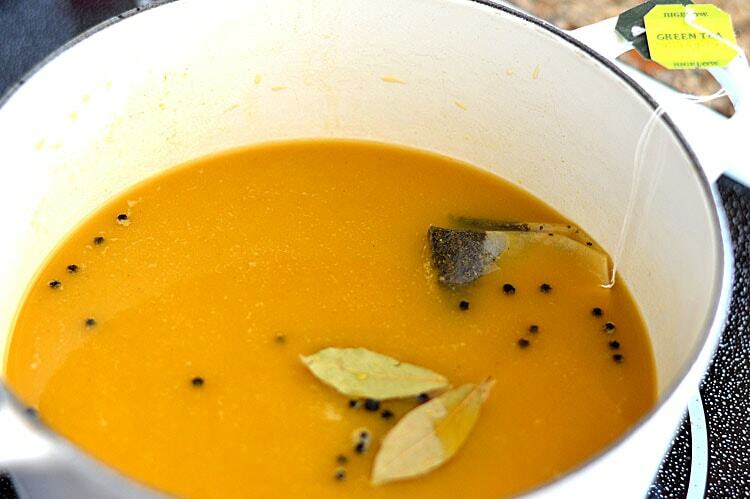 To begin, add the vegetable broth, bay leaves, turmeric, ginger and peppercorns to a large stock pot. Tie the tea bags as I have shown here so they can steep in the liquid but you can easily remove them when they have finished doing their job. I bring the liquid to a boil, add the tea bags and simmer for about 2-3 minutes. Remove the tea bags and strain the liquid to remove the bay leaves and peppercorns. 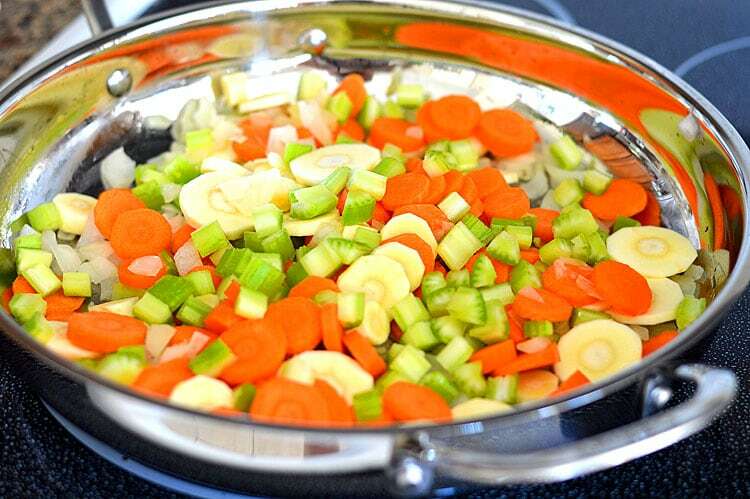 In a large saute pan, add the coconut oil, onions, celery, carrots and parsnips and season with salt and pepper. Once tender, remove from the burner and add the garlic, allow the residual heat to cook it. 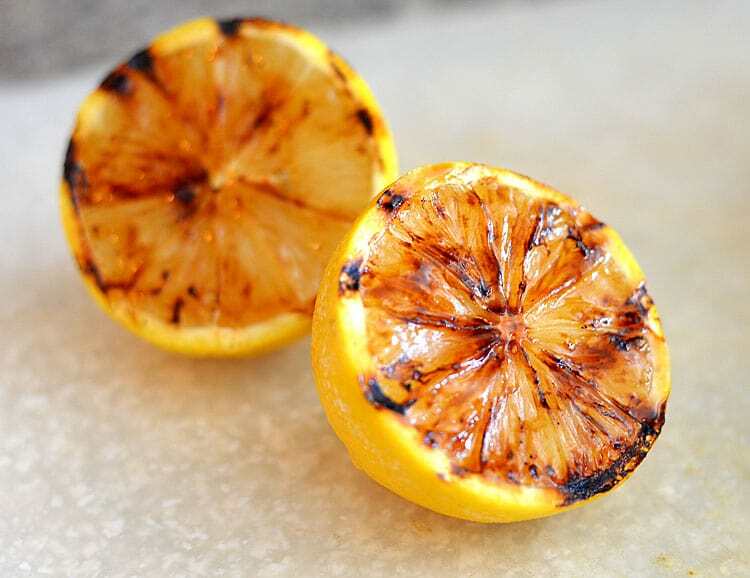 This step is completely optional, but I LOVE grilling lemons. Just look at that caramelization! They take on such a complex, savory flavor. I add these to the broth and boil for about 10 minutes. You can remove the lemon halves at this point or, for an even more lemony flavor, you can squeeze the juices into the broth as well. Taste as you go because lemon can be quite overpowering and remember, there is also lemon in the green tea. ***UPDATE: I’ve had a few people tell me that they have made this recipe and would prefer it without the lemon, so I will leave that up to you. While the broth is boiling, I rehydrate the shitake mushrooms in hot water for those 10 minutes, drain and rinse. I also prepare the noodles at this point as well. The last step is to combine the mushrooms, sauteed vegetables and broth. We added in wide noodles, but you could opt to just enjoy the soup as is. You could also add a cooked grain, such as barley. Add fresh parsley and stir to wilt slightly. Garnish with more fresh parsley and serve with your favorite crackers. Saltines are “accidentally vegan” and I love how the saltiness of these crackers compliment the soup. 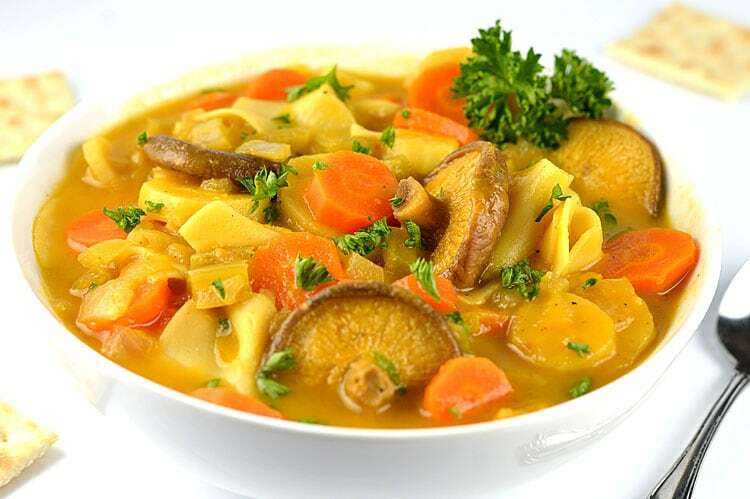 Did you make this recipe for Vegan Immunity Boosting Vegetable Soup? Leave me a comment below and let me know what you thought! While the broth is boiling, rehydrate the shitake mushrooms in hot water for 10 minutes, drain and rinse. 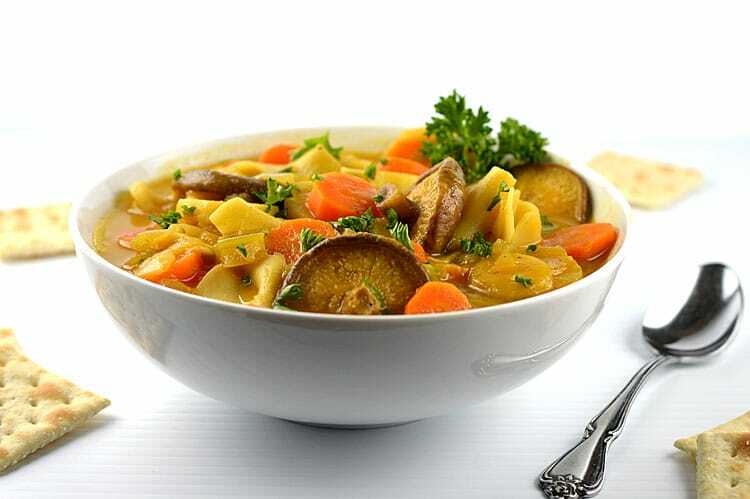 Combine the mushrooms, sauteed vegetables and broth. Hi, the method for the recipe includes lemon halves but these aren’t in the ingredients, only green tea bags with lemon. Fixed it! 🙂 Thanks for letting me know. The lemons are optional, of course. I personally like the flavor. 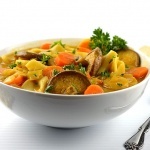 What a fantastic, delicious, completely healthy- for -you- soup! My husband and I just LOVED this and felt so good eating it with all the well thought out healthy ingredients. Thank you!!!! You are a genius! They took photos from my blog too and posted them on their website, facebook, twitter and google+. You might want to see about reporting the copyright infringement. They posted your photos on their facebook on June 26. What, no hot peppers???? I added a de-seeded red chilli to mine – fabulous! I cannot believe how good this is! I added cayenne and kale with mine, and it turned out fantastic. I don’t even like carrots or celery, but this recipe made them taste delicious. Thanks! Just tried it. I made a few modifications and next time I make it I will change it a bit more. It tasted delicious. more because I like smaller bites. These were are very minimal changes. The taste of the recipe itself was delicious! I definitely recommend it! And I think the green tea was a great idea. rhe perfect pick me up for when youre feeling low. This looks great —- but I wish the recipe was laid out in a more conventional, reader-friendly style! Ah, found it —- took awhile to load! OHMYGOSH this is the best soup I’ve ever had!!!! So easy to make and the broth is to die for! Needed a little extra vegetable broth as it does make a lot of contents and I added extra ginger and fresh turmeric root. (Also left out the lemon, might add a squeeze in my next bowl to see how it tastes) Will def make this again and again!!!! Thank you! Hi! How many does this recipe serve? I would say two bowls. Feel free to double the recipe! 🙂 I have heard from some that they prefer it without lemon (or less of it), so I would advise adding that to taste. This is my new FAVORITE soup! SO MUCH FLAVOR! I made it for my hubby, as he has the flu… but will be adding this to my rotation os regulars! I forgot to add: what quantity of mushrooms did you use? I did about 1/2 cup chopped fresh shitake and it was just about right with the double broth. I also used about 1/2 cup of mushrooms. The more mushrooms the better in my opinion, but that’s just because I love them 🙂 P.S. I hope your husband gets over the flu fast & that you stay healthy! !